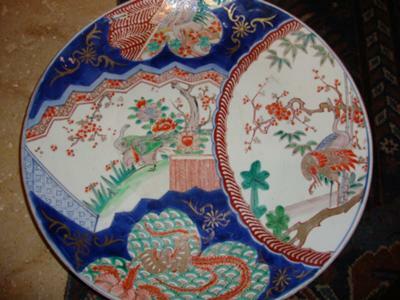 I have recently purchased this plate and was told that it was Chinese Imari, Qianlong (Eighteenth Century). I am not convinced. Please help me identify this correctly? I can't see any signs of age on your plate, the ones I have, show signs of age, areas on the plate missing glaze or rust spots in the glaze from age, I don't see that in your plate, maybe its the photos? I looked on the bottom of my plates and there is 3 blue rings around the outside of the base and 1 on the inside, sorry for the mix up. 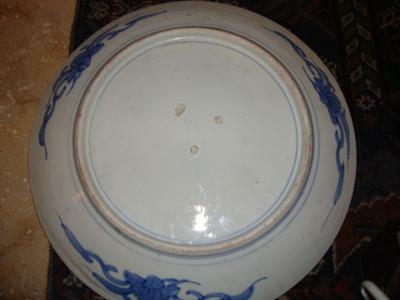 Hi, I have several early Japanese Arita dishes, most of the early Meiji dishes have 4 lines on the bottom, two on the outside of the base and two on the inside of the base, google Japanese, Arita porcelain and get a lots of information. the town Imari is right next to Arita, and they both copied each other, yours looks to be Arita Imari, early Meiji. Beautiful plate, but not Chinese. This is Japanese. I doubt it is Imari, but don't know much about Japanese porcelain patterns. I recommend you ask at asianart.com, they have people specialized on Japanese ceramics.